Distinctive features: Low-cost hand-held calculator, achieved by using a one-piece injection moulding for the whole casing and keyboard, and a low-functionality "calculator on a chip" integrated circuit. Display 8 digits, red LED. Four-function - Fixed decimal point (2 places of decimals). Integrated circuit - Mostek MK5010P "calculator on a chip", & 24 transistors. Power supply - 9v (PP3). Size - 80 x 137 x 23 mm (3.15" x 5.4" x 0.9"). Introduced February 1972, cost just under US$100 / GBP£40. Rapid Data Systems & Equipment Ltd., Made in Canada. The circuit board & keypad assembly. The main circuit board carries the Mostek "calculator-on-a-chip", a couple of dozen discrete transistors (mainly to drive the display), and the LED display. This calculator can be found, less commonly, in a cream or dark green casing. This was a very low-cost calculator - the first sub-US$100 / sub-GBP£40 electronic calculator. This was achieved by using a single "calculator on a chip" integrated circuit, a low-cost keypad design, and an ingenious one-piece polypropylene moulding for the case incorporating the front, the back, the key caps, and the battery compartment cover. But this does give it a very cheap feel. 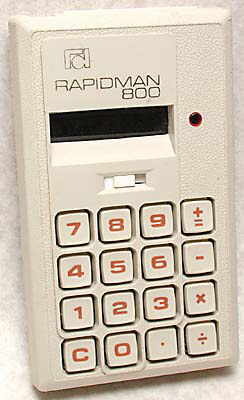 Rapid Data manufactured several innovative electronic calculators in the early 1970s, including one of the first with Liquid Crystal Display (LCD), the Rapidman LC1208.